A mezzanine floor is a semi permanent structure which is created between the existing floor and the ceiling, in order to create an additional level. This is considered a highly cost effective way to extend available space when compared to alternative means such as relocating or extending premises. However, it is very easy for the costs to spiral if insufficient planning and consideration are put into the construction and design of the mezzanine. With that mind, here are seven important guidelines for keeping the cost of installing a mezzanine floor to a minimum, and within your budget. 1) How Will The Floor Be Used? Your initial consideration should be how the new floor will be used. For safety reasons, loading requirements are a primary concern when designing mezzanines. However, over estimating these requirements is one of the most common reasons for unnecessary additional costs being factored into the specifications. Naturally, you want to ensure that the floor is able to sustain the requisite weight. But you want to check and double check your calculations to make sure that the optimal amount of structural steel content is incorporated into the mezzanine floor; no more, no less. There are building regulations which dictate the minimum loading specifications. Currently, this is set at 3.5 kN/m2 for a uniformly distributed load, such as office space. If you intend to install a mezzanine floor for storage purposes then you will need to raise this specification quite considerably, to a minimum loading of 4.8 kN/m2. For particularly heavy duty or rolling materials, this figure will need to be raised even further. Your installation company will be able to help you with the calculations and give you advice on your loading requirements. Since the biggest part of the budget usually goes on structural steelwork, you can reduce your costs by optimizing the column grid which is used. Again, this is a decision which your installation company will need to be heavily involved with. They will be able to give you a range of options and provide a breakdown of the costs involved with each one. Ideally, the goal when determining the positioning of the columns is to balance the required carrying capacity with an unobtrusive layout. But as a general rule, the more columns you can include, the cheaper the cost of overall installation will be. 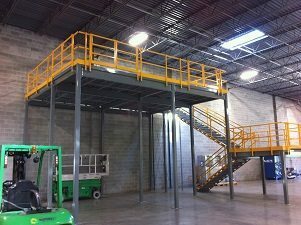 Get a Mezzanine Quote Today! There are regulations in place which determine what safety measures and features must be incorporated, depending on the height at which the mezzanine floor is placed. For instance, a mid-staircase landing may be necessary if the floor is very high. Therefore, you can greatly cut your costs by making sure that the mezzanine floor is placed at the minimum height possible. accommodate heavier load points. This will reduce the materials which are needed in the construction of the mezzanine floor, thereby reducing your costs. Your costs will increase in line with the number of access points. Therefore, you should consider how few access points are feasible within your operational requirements. Before making a final decision, you should also check your local building regulations to ensure that the figure you determine is compliant with minimum legal requirements. As with calculating your load requirements, the key to minimizing your expenses is to avoid over specification. Although installing a mezzanine floor is the most cost effective means of doubling your working space, it should be kept in mind that offices on mezzanines will cost more. This is because expenses will be incurred as a result of complying with safety requirements. For example, fire escapes may need to be included in the design at strategic points in order for the new structure to be compliant with building regulations. Factoring these features in from the start will avoid accumulating unplanned expenses at a later date. Which decking surface you opt for may be dictated by the purpose for which the mezzanine will be used. However, if there is room for flexibility then you may be able to make savings by opting for a cheaper finish. Steel is extremely durable and hardwearing and may be necessary for the storage of heavy loads. But for more general purposes, 38mm high-density particle board decking will be more than adequate. 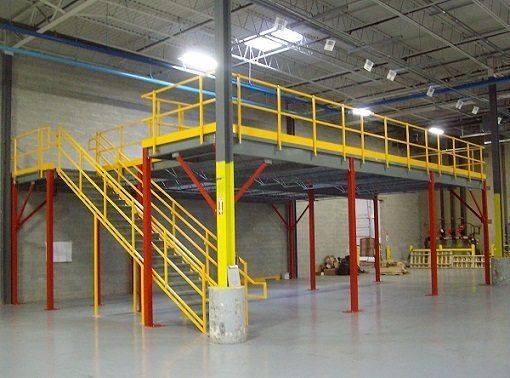 Most mezzanine suppliers have a range of services to help ensure that you, the customer, end up with a mezzanine floor which is optimized to your individual needs. This can include an in-house design team, bespoke manufacture, and a highly skilled and professional installation service.